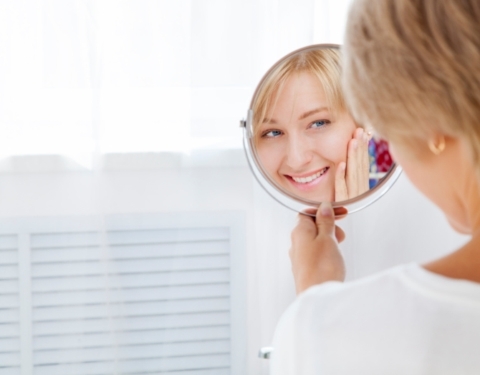 Acne occurs when there is an improper turnover of skin cells. The retained cells can trap protein and the skin’s natural oil under the skin. The trapped oil and protein then become food for Propionibacterium acnes (P. acnes). P. acnes bacteria are somewhat responsible for acne symptoms. Research shows that acne is primarily influenced by hormones, sleep patterns, and stress levels—but what you eat plays a role as well. Promoting healthy skin is all about developing good nutritional habits through your diet. 1. Vitamin A: Vitamin A helps regulate the skin cycle so protein and oil won’t get trapped under the skin. The best food sources that contain vitamin A include broccoli, fish oil, carrots, spinach, and salmon. 2. Zinc: Evidence suggests that people who have acne have lower than normal levels of zinc. Zinc helps calm the skin when breakouts occur. Zinc can also help prevent acne breakouts by creating an environment unreceptive to the growth of P. acnes. You can find zinc in turkey, almonds, Brazil nuts, and wheat germ. 3. Selenium: This mineral contains antioxidant properties that will help protect skin from free radical damage. A Swedish study that was conducted on 42 men and 47 women found that participants who consumed selenium and vitamin E together for 12 weeks saw a significant improvement in their acne. Selenium can be found in tuna, wheat germ, salmon, eggs, and brown rice. 4. Vitamins E and C: Both vitamins have a calming effect on the skin. You can find vitamin C in lemons, oranges, papaya, grapefruit, and tomatoes. You can find vitamin E in nuts, olive oil, sunflower seeds, sweet potatoes, broccoli, and leafy green vegetables. 5. Omega-3 fatty acids: Certain molecules can lead to inflammation and result in skin problems. This can be prevented by consuming omega-3 fatty acids on a daily basis. Omega-3 fatty acids support healthy skin turnover, which will keep the acne at bay. You can find omega-3 fatty acids in sardines, salmon, almonds and walnuts. What Should I Avoid In My Diet to Prevent Acne Breakouts? Alcohol: Although drinking alcohol won’t cause acne, too much alcohol can dehydrate your skin cells. Water is important to removing toxins from the body—inflammatory toxins in particular that can lead to acne. Sugar: Consuming too much sugar damages the collagen and elastin in your skin; these are important fibers that keep the skin smooth, firm, and blemish-free. Salt: Consuming too much salt causes tissues in your skin to swell and can make your face seem puffy. Iodized salt is known to aggravate acne if taken in high doses. White bread: According to a recent study conducted by researchers in Australia, high-glycemic foods, such as pasta, white bread, and cakes, can exacerbate acne. Get more sleep: The risk of psychological stress increases by 14% for every hour of sleep lost. Stress increases glucocorticoid production, which leads to abnormalities in skin structure and function. These abnormalities can include breakouts, blackheads, saggy skin, and wrinkles. Exercise: Since stress can contribute to acne outbreaks, exercise is a great way to reduce stress. Exercise helps increase your blood circulation, which will send more oxygen to your skin cells. Sip water: Drinking lots of water is a fantastic way to flush out internal toxins and hydrate your skin, keeping it blemish-free. Researchers at the University of Missouri-Columbia suggest that consuming about two cups of water a day will boost the blood flow throughout the body and skin. Wear sunscreen: Inflammation from sunburn can irritate the face, and possibly cause it to break out. Make sure to protect your skin with sunscreen. Cleanse twice a day: The face contains more oil-producing glands than any other part of the body. Add in a day’s worth of makeup, sweat, dust, smog, and dirt, and you have yourself a pore-clogging concoction. If your face is not washed on a regular basis, oil will seep into the pores, which will result in blackheads and pimples. Shimer Bowers, E., “Healthy Diet, Healthy Skin,” WebMD web site; http://www.webmd.com/skin-problems-and-treatments/acne/features/diet-and-skin?page=4, last accessed September 2, 2015. Jackson-Cannady, A., “10 Lifestyle Steps to Help Your Acne,” WebMD web site; http://www.webmd.com/skin-problems-and-treatments/acne/features/lifestyle?page=3, last accessed September 2, 2015. Jimenez, A., “9 Best (and Worst!) Foods for Healthy Skin,” TotalBeauty.com; http://www.totalbeauty.com/content/gallery/best-worst-skin-foods/p80042/page10, last accessed September 2, 2015.